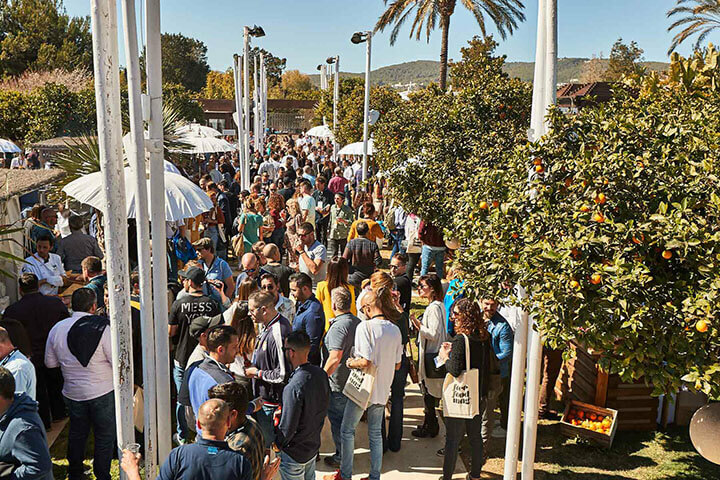 On March 15, the gardens of the Agroturismo Atzaró saw the return of ‘We Are FaceFood’, as it provided the setting for Ibiza’s second international gastronomic event, “We Are FaceFood 2019”. 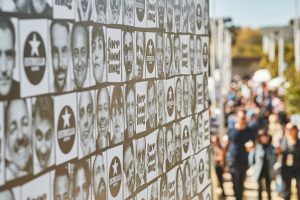 For the second consecutive year, the day served as a meeting point, with around 1,000 attendees, six prestigious speakers and 32 premium brands. A perfect opportunity for all the professionals and companies from the island’s catering sector to extend their knowledge and engage in networking. 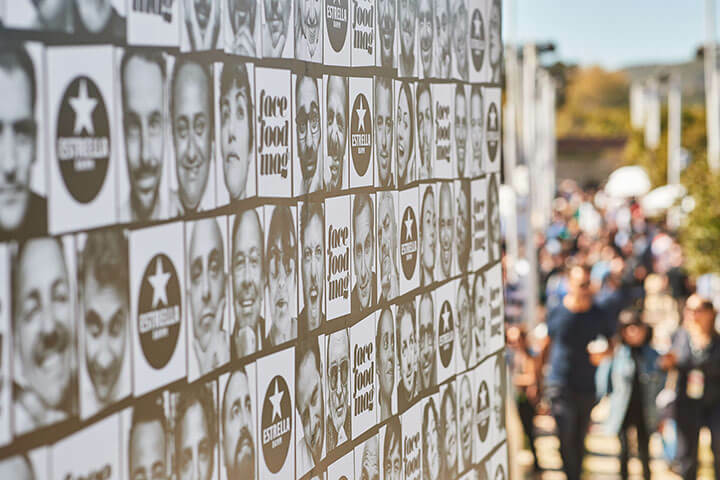 At 11.00 a.m. the doors opened on this ‘We Are FaceFood Ibiza 2019’ event, in which four renowned chefs, a gastronomic marketing professional, and a restaurant front-of-house expert delighted those attending with their presentations. An exciting innovation at this year’s ‘We Are FaceFood’ (thanks to the cooperation of the Consell d’Eivissa [Ibiza Island Council] and local producers) was an authentic mercat eivissenc [Ibiza market], showcasing products typical of the island such as wine, olive oil, Ibiza honey, cold meats, potatoes (including the Ibiza red potato), vegetables, nuts, bread and traditional cakes. 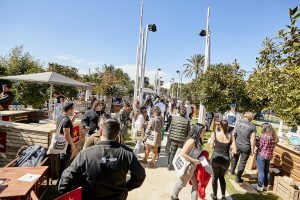 For this second year, the event had grown in every sense, including participation by first-class gourmet brands, who saw the event as an opportunity to showcase their products on the island of Ibiza. 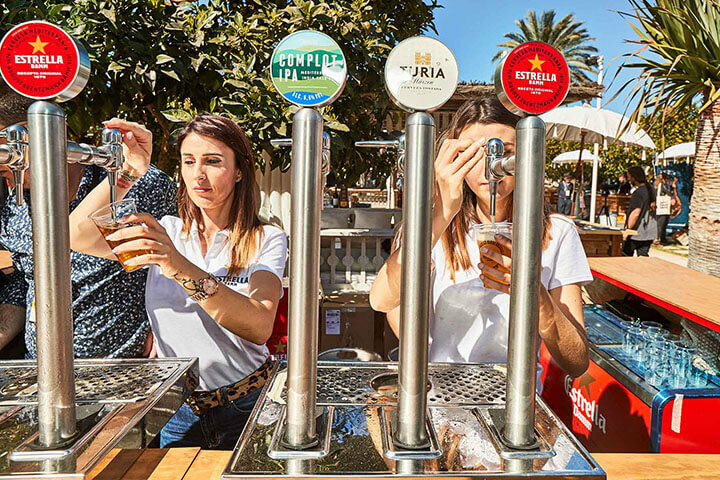 The event (sponsored by Estrella Damm, together with partners including the Casino de Ibiza, Consell d’Eivissa, Seahorse Ibiza, Agua22, Wooda Ibiza, Sonoibiza, Familia Marí Mayans, Equipat, Xpepper, Agroturismo Atzaró, Klimer, Maderas Planells, THB Hotels, Rockandmerch and Print Xpress) took off with a gastronomic spectacular: a demonstration of hand-filleting tuna by Arrom, Pescados Consuelo y Pardalet, Reina, chef of the Nagai Restaurant and Walter Sidoravicius, of the Blue Marlin Ibiza. That was followed by talks and presentations by some of international cuisine’s best-known figures including Oliver Peña (Restaurante Enigma, Barcelona, one Michelin star); Roberto Ruiz (Restaurante Punto Mx, Madrid, one Michelin star); João Rodrigues (Feitoria, Lisbon, one Michelin star) and Carles Abellán (Bravo, Tapas 24, ENA, La Barra de Carles Abellán… one Michelin star). Those in attendance also enjoyed a presentation by a true front-of-house star. We are talking about Xavi Alba, head waiter at Tickets. There was in addition a presentation on gourmet sector marketing by Borja Beneyto Orban (Brandelicious). 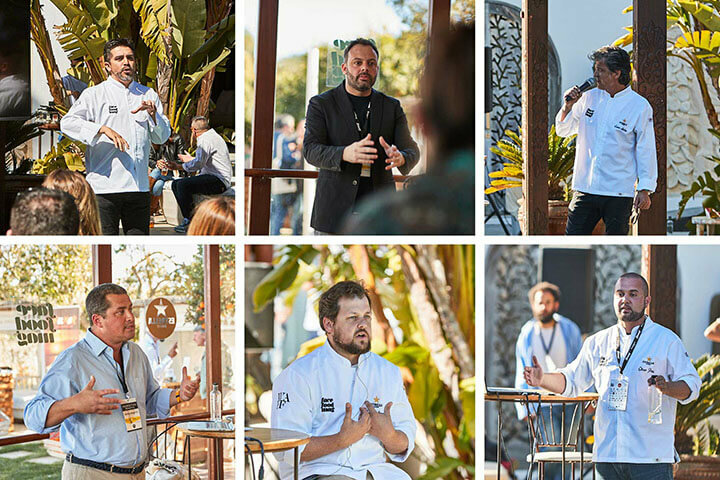 The chef Roberto Ruiz (Punto Mx, one Michelin star) launched the ‘We Are FaceFood’ round of presentations, speaking about “the complexities involved in transforming Mexican cooking into Michelin-standard gastronomy”. 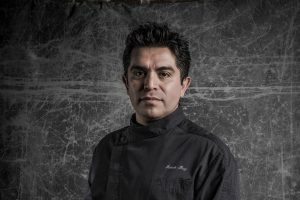 Ruiz defined his cuisine as “Mexican cooking updated”. In his restaurant, he combines the culinary tradition of his country with Iberian ingredients, with all the added complications this brings. Part of the difficulty of having a premium-grade Mexican restaurant, as he explained, “is that many of the ingredients are not produced in Spain”. After the Mexican chef’s presentation, it was the turn of João Rodrigues (Restaurante Feitoria, one Michelin star). The Portuguese chef impressed those in attendance with his explanation of his project, ‘Materia’. “Materia was set up to showcase the best of Portuguese cuisine, both to foreigners and to the Portuguese themselves, by using ingredients that few people are familiar with,” he revealed. At 1.30 p.m., it was time for a break, a time deliberately built in so that those attending could enjoy networking, live jazz music and, of course, the various gourmet offerings, thanks to the collaboration of Aceite Castillo de Canena, Agua KM0, Alaska Seafood, Aquanaria, Arctic Crab, Arrom, Bedrinks, Beef on Food, Bemed, Guzmán Bidfood, Diego Carnes y Jamones, El Encinar Humienta, Gasos Felmar, Gin Mare, Fever Tree, Gran Blau, Innovachef, Caviar Paris 1925, International Cooking Concepts, Josper, Klimer, Koppert Cress, La Belle Huitre, La Finesse Truffles, Consuelo & Pardalet, Plancton Marino, Triticum, Vino & Co, Wan Run, Xpepper, Bodegas Oissät and Moët Hennessy, who exhibited their products on the ‘We Are FaceFood Ibiza 2019’ stands. After the break, Xavi Alba, head waiter at Albert Adrià’s restaurant Tickets, resumed the programme of talks with his presentation: “The Dining Room, a second look?” in which he stated that “The waiters at Tickets don’t address you as ‘usted’ [the Spanish formal mode of address] because if they did, it wouldn’t mean that they were going to provide a better service”. The head waiter at Tickets was followed by Borja Beneyto, one of the leading exponents of gourmet marketing, the creator of the blog ‘Cuaderno Matoses’ and the owner of ‘Brandelicious’. Borja talked about “Disruption and trends in the global restaurant sector”, and about how technology has influenced the development of all gourmet concepts and brands. After another short break, the chef Oliver Peña (Enigma, one Michelin star) took the stand to talk about the “natural evolution of Enigma”, and about his own development as a culinary professional. Mr Peña highlighted the importance his customers attribute to the “global experience offered by Enigma, even beyond the food itself”. The final presentation of this gastronomic event, delivered by the chef Carles Abellán (Bravo, Tapas 24, ENA, La Barra de Carles Abellán… one Michelin star), was a talk entitled “Carles Abellán Brands”. 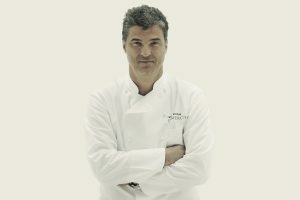 The chef provided a detailed account of his 18-year entrepreneurial career, during which he has launched no more and no less than 19 gourmet brands, and fascinated his audience with vivid anecdotes of his experiences. Following this presentation, at 6.00 p.m., the director of FaceFoodMag, Jesús Trujillo, closed the ‘We Are FaceFood Ibiza 2019’ gastronomic event by thanking all those who had attended (and particularly the speakers), as well as all the brands who exhibited and the partner companies, without whom this second ‘We Are FaceFood’ event would not have been possible.